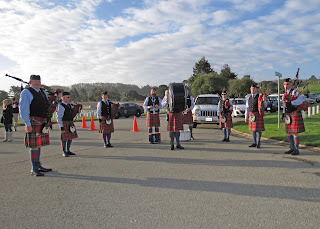 Saturday, 12 December, 2015 was a sunny and wind free morning that helped to make the ceremony more enjoyable. Members from Squadrons 18 and 188 were in attendance, as were veterans, soldiers’ family members and over 100 members of the general public. where presented by the Daly City Police Department, followed by the National Anthem, led by Regina Gonnella from the Avenue of Flags Committee. 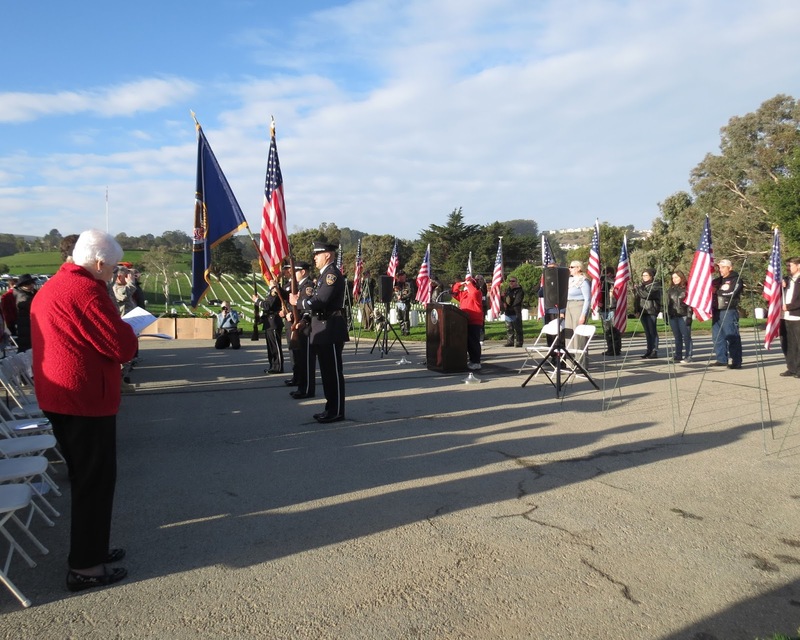 The Pledge of Allegiance was led by Kristen Matthias, Regent, San Andreas Lake Chapter, Daughters of the American Revolution. After that, a call for a minute of silence took place at exactly 9:00 AM. The minute of silence occurred simultaneously, at each National Cemetery across the nation, from Washington DC to Guam, and all the Armed Forces and Merchant Marines were honored. 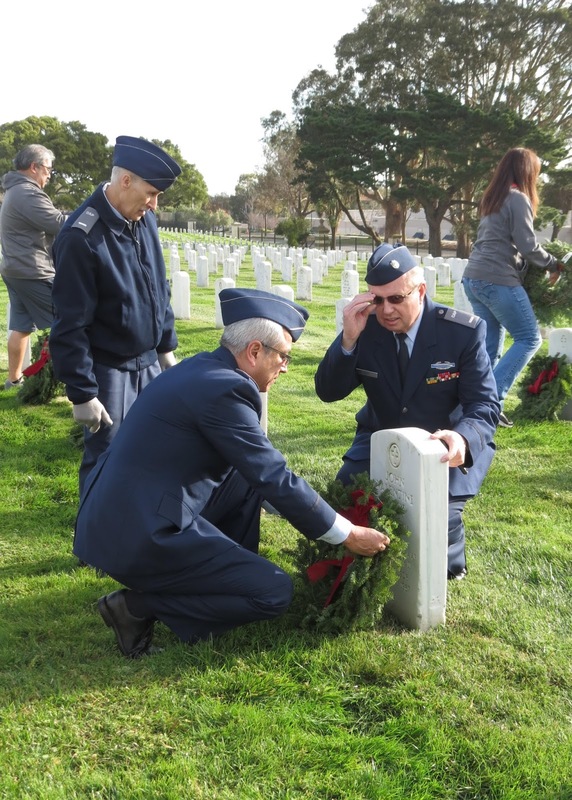 It was a very emotional ceremony, especially during the presentation of the wreaths by individuals and when saluting each one of the different branches of the Armed Forces as well as the Merchant Marines and the POW/MIA. Gold Start Families, parents of sons/daughters that are buried in the cemetery, also presented a wreath to honor them. 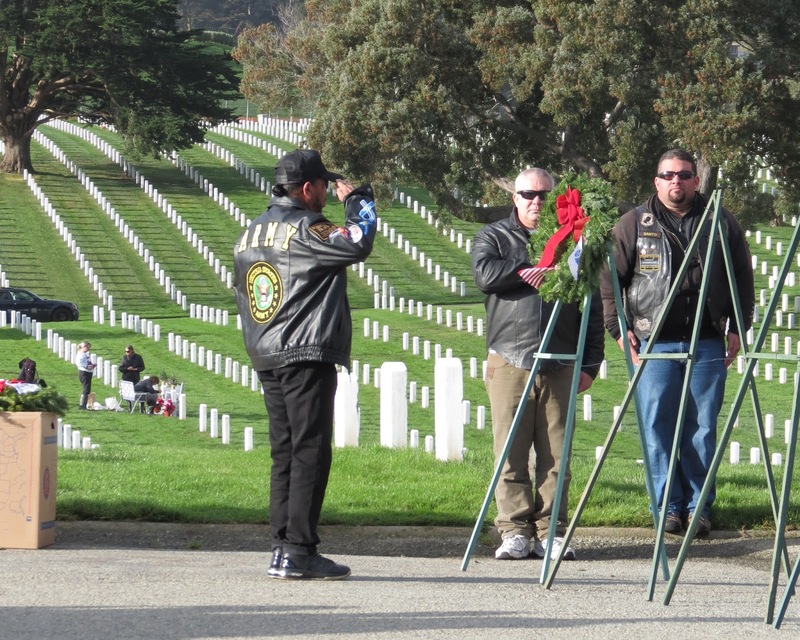 After the main speaker, Lt Col Jeff Brooks from the 23rd Marines, instructions were given about how to place the wreath on each tombstone. The closing remarks were given by Kevin Graves, a Gold Start Father. He was in Afghanistan not too long ago, right in the battle field. He placed soil from that spot in vials that he presented to other Gold Start Families attending the event, as remembrance of the place where their sons/daughters had shed their blood. 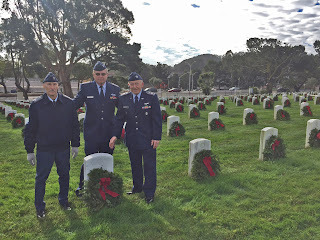 Taps was played by Petty Officer Lena Gemmer and Chief Petty Officer Jared Zygarewicz from the U.S. Naval Sea Cadet Corps Band of the West, and the colors were retired. 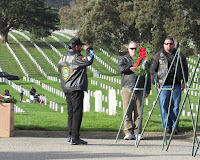 1300 wreaths were placed by the attendees in a specific section of the cemetery. 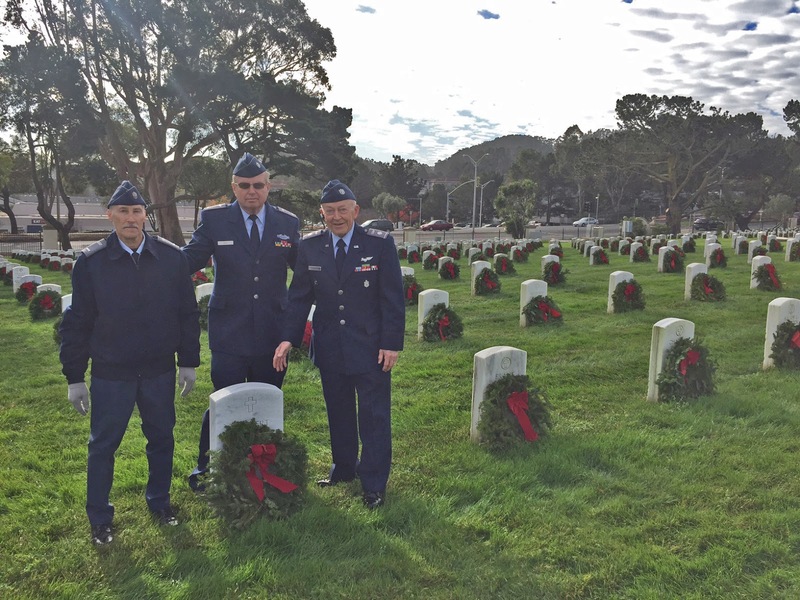 Every year, a new section is covered, so eventually all 145,000 tombstones will be honored. 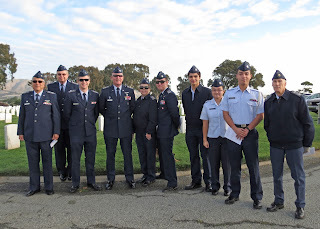 It was a very moving ceremony and a good way to honor and remember our fallen heroes. 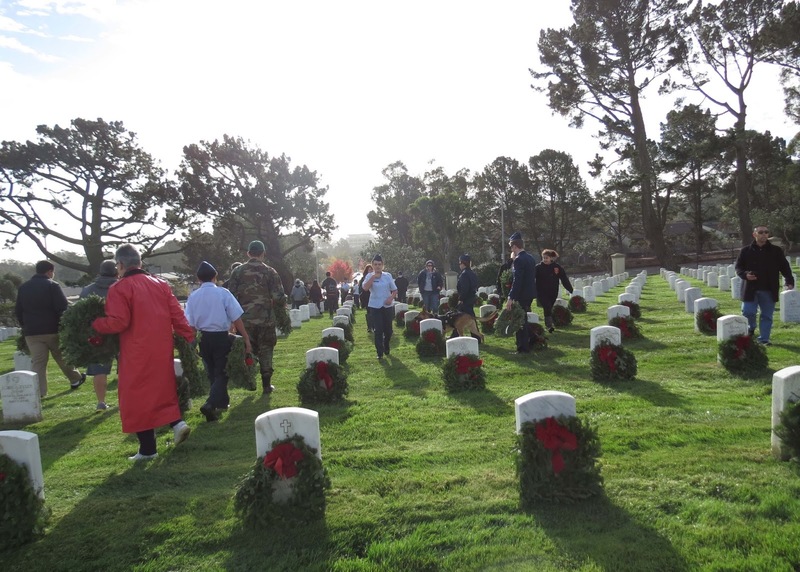 You are invited to return on Saturday, 2 January, 2016 at 8:00 AM to help with the wreath cleanup.